Hinayana (Sanskrit: «inferior vehicle»; Chinese: 小乘 Xiǎoshèng; Japanese: Shōjō; Vietnamese: Tiểu thừa) is a term coined by the Mahayana, which appeared publicly around the 1st century CE. There are differing views on the use and meaning of the term, both among scholars and within Buddhism. The meaning of ‘vehicle’ here is probably best understood as a ‘movement’, rather than some sort of school or tradition. Hinayana is used as a name to refer variously (to one or more of doctrines, traditions, practitioners or thoughts that are) generally concerned with the achievement of Nirvana as a Sravaka-Buddha or a Pratyeka-Buddha, as opposed to the achievement of liberation as a Samyaksam-Buddha. For those that view the term as being relevant to traditions, some hold the view that Hinayana is cognate with solely the Early Buddhist Schools, while others hold the view that Hinayana is also cognate with the modern Theravada tradition. Moreover, many hold that the term was coined to be purposely pejorative, while others do not. Hinayana as doctrine would include the Sutras taught by Buddha that admonish the practitioner to achieve Sravaka-Buddhahood or Pratyeka-Buddhahood. Hinayana as ancient tradition would include those schools who solely followed such sutras, some of whom actively rejected the Mahayana sutras during the time of the rise of the Mahayana, around 2,000 years ago, cognate with most of the Early Buddhist Schools. Hinayana as a tradition in general would include those schools who solely follow the sutras above. This would be cognate with what is also known as Nikaya Buddhism. Hinayana as practitioner would be an individual of any school (including Mahayana) whose goal is that of a Sravaka-Buddha or a Pratyeka-Buddha. Hinayana as thought similarly would be a thought of any practitioner that leads to the goal of a Sravaka-Buddha or a Pratyeka-Buddha, but not to Samyaksam-Buddha. From the outside the distinctions between these differing definitions would appear to be minimal, even trivial. However within Buddhism the differing interpretations of Hinayana have consequences that are sometimes quite far-reaching. 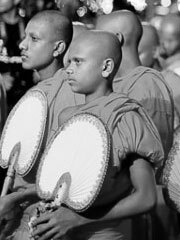 It is primarily the interpretation of Hinayana as a tradition that has led to the most concern, especially as many people have seen the term as a slur against the schools of Nikaya Buddhism–schools that solely follow the sutras given by Buddha that admonish the practitioner to achieve Sravaka-Buddhahood. Samyaksam-Buddhas (Pali: Sammasambuddha): (also known in the Mahayana as Bodhisattva-Buddhas) gain Nirvana by their own efforts, without a teacher of the entire path. They may then lead others to Enlightenment by teaching the Dharma in a time or world where it has been forgotten or has not been taught before, because a Samyaksam-Buddha does not depend upon a tradition that stretches back to a previous Samyaksam-Buddha, but instead discovers the path anew. Pratyeka-Buddhas (Pali: Paccekabuddha): are similar to Samyaksam-Buddha, in that they attain Nirvana by themselves, but they remain silent and keep the discovered Dharma to themselves. Sravaka-Buddhas (Pali: Savakabuddhas): gain Nirvana, but attain Enlightenment by hearing the Dharma as initially taught by a Samyaksam-Buddha. After attaining enlightenment, Sravaka-Buddhas might also lead others to enlightenment, but cannot teach the Dharma in a time or world where it has been forgotten or has not been taught before, because they depend upon a tradition that stretches back to a Sammasambuddha. It appears that the distinction between vehicles and paths arises in early Mahayana sutras, such as the Lotus Sutra, where it is stated that there is one path — the path to Nirvana -, but there are different vehicles. In this sense, the vehicles are described as representing the fruit of three types of Buddha found in Nikaya sutras, as mentioned above. For instance, in Chapter three of the Lotus Sutra, there is a parable of a father promising three carts to lure sons out of a burning building, where the goat-cart represents Sravaka-Buddhahood; the deer-cart, Pratyeka-Buddhahood; and the bullock-cart, Samyaksam-Buddhahood. This quote tells us something more about early Mahayana views: That it is the vehicles that are taught as a method for journeying on the path to enlightenment. It is here that we can see the basis for term being used to indicate differences of doctrine. The Lotus Sutra (Ch.3) continues: «Know this! All these three vehicles are praised by sages; free and independent, without wanting to rely on anything else. If there are beings who desire speedily to escape from the triple world and seek nirvana for themselves, these will have the vehicle named the ‘sravakayana’, just as some of those children come out of the house for the sake of a goat-cart. If there are beings who seek self-gained wisdom, delighting in the tranquility of their individual goodness, these will have the vehicle named the ‘pratyekayana’, just as some of those children come out of the house for the sake of a deer-cart. The Sutra then continues, declaring that the bullock-cart is «supremely restful», implying that the goat-cart and the deer-cart are inferior to the bullock-cart. This is where we begin to see the terminological origins for the term Hinayana: The Sravakayana and the Pratyekayana as vehicles inferior to the superior bullock-cart of the Mahayana. The Lotus Sutra therefore makes the distinction between the vehicles according to the type of Buddha that arises, and all Buddhists agree that a Samyaksam-Buddha is superior to a Sravaka-Buddha or a Pratyeka-Buddha, at least on the basis that only a Samyaksam-Buddha can teach the Dharma where (or when) it has not been taught before. There remains an open and active debate regarding the issue of whether Hinayana was coined to be pejorative or merely classificatory. Those who assert the idea tend to be among those who subscribe the idea of an early Mahayana schism, and who believe that there was a strong history of polemics between the early Mahayana and other early Buddhist schools. Those who assert that the term was coined in a merely classificatory manner, generally consider the pejorative accusation to be a Fundamental attribution error. Most agree that the usage of ‘hina-‘ as a prefix represents those «inferior», -inferior because they do not lead to the attainment of Samyaksam Buddhahood; so, the hinayana vehicles are those vehicles that lead to Sravaka Buddhahood or Pratyeka Buddhahood. The difference of opinion is whether or not the term was chosen because of the other meanings attributed to it — apparently suggesting a nuance to the otherwise categorative term. Another argument for criticism of the Hinayana by the early Mahayana is a citation from the Lotus Sutra, where a large number of Bikkhus are said to have walked out of the discourse. We are told early on in the Sutra that there are more than 20,000 Bikshus and Bikhunis present (as well as many thousands of Bodhisattvas). Very early on 5,000 ‘haughty’ Bikshus get up and leave. This shocking behaviour certainly represents something — but it cannot represent the Hinayana tradition, as the majority of Bikshus remain; what it probably represents were a minority of followers of Nikaya schools who were attempting to defame and denigrate the early Mahayana. It appears that there were many Nikaya practitioners who did not wish to criticise or denigrate the new Mahayana movement, indicated by the majority of Bikshus who remained throughout the discourse. It is hard to come to a conclusion on the issue of pejorativeness. We can find Mahayana Sutras and traditions which repeatedly admonish the trainee Bodhisattva not to criticise any of the Buddhist schools. The mere fact that there is such a strong admonishment against criticising the Hinayana indicates a degree of defensiveness on behalf of the Mahayana regarding this issue. A bodhisattva does not hold other Buddhists in contempt, not even those who follow the Hinayana path, nor does he cause them to have doubts or regrets by criticizing their way of practice or making discouraging remarks. By the 3rd Century CE, in the ethics chapter of Asanga’s Bodhisattvabhumi, we find an explicit injunction not to criticise or reject the Hinayana texts or traditions, where Trainee Bodhisattvas are instructed not to «disparage the Hinayana, or over-encourage others to learn Mahayana». Candragomin wrote a very influential twenty verse summary of Asanga’s Ethics, written or summarised as a set of vows to be taken by a trainee Bodhisattve. The 15th Verse (derived from Asanga’s chapter on ethics) cites «rejecting the Sravakayana» as a root downfall. Candragomin’s vows were adopted by the Indo-Tibetan Mahayana tradition via Atisha, and are still used today by the Gelugpa and Kagyupa schools. Bodhisattvas should practice all paths — whatever is a path of a sravaka, a pratyeka or a Buddha — and should know all paths. So, certainly in the early centuries CE, the Mahayana tradition was doing its best not to criticise or condemn the Hinayana vehicles. «Between the 1st Century B.C. to the 1st Century A.D., the two terms Mahayana and Hinayana appeared in the Saddharma Pundarika Sutra or the Sutra of the Lotus of the Good Law. About the 2nd Century A.D. Mahayana became clearly defined. Nagarjuna developed the Mahayana philosophy of Sunyata and proved that everything is Void in a small text called Madhyamika-karika. About the 4th Century, there were Asanga and Vasubandhu who wrote enormous amount of works on Mahayana. After the 1st Century AD., the Mahayanists took a definite stand and only then the terms of Mahayana and Hinayana were introduced. hīná mfn. left, abandoned, forsaken RV. left behind, excluded or shut out from, lower or weaker than, inferior to (abl.) Mn. MBh. &c.
left out, wanting, omitted MBh. defeated or worsted (in a lawsuit) Yājñ. lost or strayed from (a caravan) Pāṇ. i, 4, 23 Kāś. brought low, broken down in circumstances ŚrS. m. a faulty or defective witness (of five kinds, viz. anya-vādin, kriyā-dveṣin, nôpasthāyin, nir-uttara, āhūsa-prapalâyin) Yājñ. Sch. subtraction (= = vyavakalana) MW. (ā), f. a female mouse (wṛ. for dīna) L.
(am), n. deficiency, want, absence (velā-hīne ‘before the right time’, unseasonably’) VarBṛS. Yājñ. An argument used by those who consider Hinayana to be pejorative is based on the fact that if the term was to mean ‘Small or Lesser vehicle’, then the term chosen would have been, «Culla» or in Sanskrit «Ksulla=ksudra» giving us Ksudrayana — though ‘ksudra’ has also had a history of being used in a somewhat pejorative manner.